I was having some problems with my phone and finally resolved it yesterday with Apple. They ended having to give me a new phone as well as a pile of charging cables. All is back to normal on that front. Now shameless self promotion. It was brought up last night that I should make a Facebook page for my computer repairs. Well I’ve had one for a couple of years but never did anything with it. However here it is so people can see pictures of work I have done and hopefully call me because they need something fixed! There isn’t anything you can break that I can’t handle. I was supposed to help out two different groups, one yesterday and one today. Well weather played a part in both joining forces today. 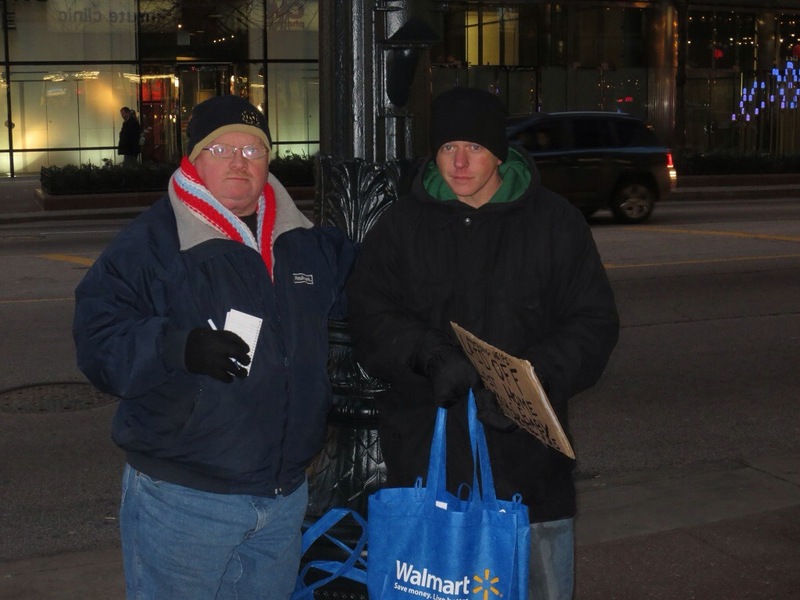 My favorites Chicago and Michiana 5 for the Homeless were back once again. It was a light trip to the city for them, only one vehicle. However Kristy Williamson organized a bunch of her friends and they showed up with multiple carloads of food, blankets, toiletries, even gift wrapped presents! The Menendez family stepped it up to another level again as well, needing to borrow a van to bring things down. There is always a need and it was appreciated. The people were so grateful and even when one got out of line his peers intervened and diffused the situation! I will elaborate more on the day later, but wanted to get the pictures up! Some of you saw the other day via my Facebook page and Twitter feed that I posted a very simple comment of I’m so mad right now I don’t even want to talk about it. I intended to write about this yesterday, however time was a little tight with everything else I was trying to accomplish and I just didn’t get to it. Most of you know that I’ve been sending out resumes daily and have had a couple responses for interviews. There was one that I interviewed for last week that they offered me a permanent position. Well that is what I was so mad about the other day when I found out that I didn’t pass the background check. Why? My panhandling incident from a couple weeks ago. While I thought it was nothing more than the equivalent of a speeding ticket, and it is, they processed me like it was an arrest. So now I have an arrest on my record and failure to disclose it and provide explanation prior to them running the background eliminated me from getting the position. Now this position I didn’t think would be a good long term fit anyway, but beggars (literally) can’t be choosers. Had I have known it was going it was processed as such, I would’ve disclosed it and provided explanation. By that point the perspective employer had check my references, had a 3 hour interview and had a good idea of my character. When I was informed of the results I laid it all on the line. While they appreciated my candor it was too late. So, what am I going to do about it. For starters I am going to fight the ticket. My grounds? Discrimination. There are conflicting ordinances in the city that are blatantly discriminatory towards the panhandler. While panhandling has been deemed legal under the first amendment through a couple of different lawsuits against the city they have enacted an ordinance outlining aggressive panhandling. This states where you can and can’t panhandle as well as how you may go about doing it. The problem is it is open to the individuals interpretation and the way it was interpreted in my case obviously did not go my way. The conflicting ordinance comes from the department of revenue and is actually referenced in the aggressive panhandling ordinance as an exemption to it. It states that a registered charity within the state of Illinois can do everything the individual can’t in all the locations the individual can’t as long as they register with the city and sign a waiver of liability against injury. So what is my next step. I am going to the court date to fight the ticket. I also want to have some ammunition ready for when I go that will back up my discrimination opinion. If anyone knows of a nonprofit that is registered with Illinois that would like some fundraising done, let me know. I will panhandle for funds, they take all the proceeds. My only requirement is that I have to do it in the same location where I got in trouble. I also need to make sure I am able to register with the city on your behalf. I will do this until the police will undoubtedly try to do the same thing again. However because I will be registered they won’t be able to interpret it any other way. At that point I have proof that the ordinance that I was originally accused of breaking is discriminatory regardless of how it was interpreted in the original situation. It’s win/win for both parties. Lastly, I had an open house interview on my birthday. It went pretty well and I aced their written skills assessment. I got a phone call yesterday letting me know out of the 30 people at the open house I am one of 10 being considered for 5 open positions. I went through a 45 minute phone interview and they are bringing me back for another in person interview with the hiring team just after Christmas. I am definitely going to disclose what happened. However I want to get to the point where they make an offer before I do. I don’t want to hide anything, however I don’t want to give any information before needed either. I feel horrible even having to think this way. message on Facebook Chi Homelessguy. I guarantee the work and if you aren’t satisfied when I’m done you don’t pay. I’m also willing to work for much less than I should charge because of the circumstances I am in. 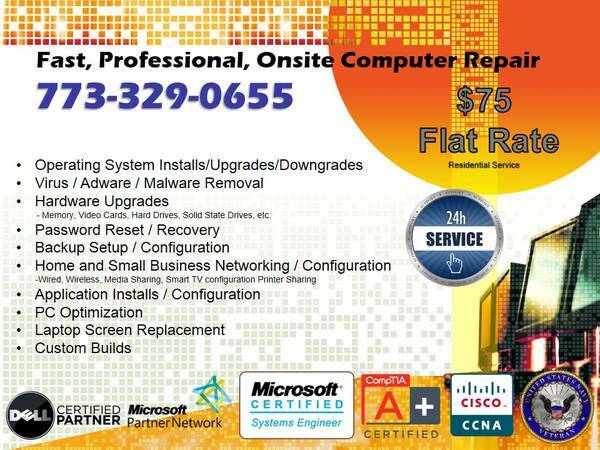 Below is an ad for my services. Anyone mentioning they saw it here will get a $25 discount as long as you are in the city of Chicago. The past week with my birthday has been overwhelming with the amount of people that have reached out. On Thursday one of my good friends called and said what are you doing this weekend. Well I’ve been blowing off my friends for a little while now while dealing with my situation. The utter embarrassment of not feeling I can tell them what is going on is something that sits on my mind daily. The fact that I’m so open on this blog with people I don’t really know compared to being so closed with the people that I’ve known for years. It kind of came to a head this weekend. Well I can’t say they don’t know something is up. People I used to see on an almost weekly basis has turned into haven’t seen them in a couple months. My excuses for last night just weren’t going to work. I had to get together with them whether I wanted to or not. What comes when I get there is over the top. I thought we were just going to go with myself and three pretty close friends. We got there and more and more people kept showing up. It ended up being close to 20 people. While I had a good time, with that many people I really didn’t have a choice. The whole time things were running through my mind of what I once had, how I was able to enjoy life. Putting up the appearance that all is well when in reality I don’t really want to be there. I keep thinking am I letting my pride get the best of me? I probably am, but the burning desire to have something going to turn things around before I say anything drives me too. I just feel that I’m living two lives. The one that I have to portray with my friends and with people I’m interacting with while looking for permanent work and the one where I can be open and honest with what is going on and what I’m trying to do to improve the situation. These are the types of things that go through my head on a daily basis. I hope that eventually I can achieve a balance in my head and be comfortable with it. At this point it is something that eats at me every day. message on Facebook Chi Homelessguy. I guarantee the work and if you aren’t satisfied when I’m done you don’t pay. I’m also willing to work for much less than I should charge because of the circumstances I am in. Do you have an old laptop you aren’t using? I’ll barter my services for it. I have to qualify what I write before I get into the meat of the subject. I am homeless. I am currently working a temporary job. I have a few people out there that have very generously helped me after reading this blog, seeing my twitter posts or have found me on Facebook. For all of that I am grateful. I send out resumes on a daily basis. I have had a couple interviews. I am bound and determined to work my way out of this situation. However working your way out of homelessness is expensive. I’ve written a couple blog posts regarding this, you can read them about them here The economics of being homeless and Working your way out of homelessness. The temperature has dropped and currently my work situation is not going to last forever. I still have another week before I will even see the first check for it. Reality is that when I am not working occasionally I am honestly panhandling to try and save every penny that I can to get myself out of the situation faster. I am spending as little as humanly possible so I can save. The more I spend now the longer it will take me to get into an apartment. I also must eat, I don’t get any food benefits. I need to do laundry. I need to shower. I am respectful, I have a sign that explains what is going on. I don’t lie. I don’t block traffic. I hold the sign and don’t say a word unless someone says something first or is kind enough to give me something I say thank you. I also separate what little money I have for different things. Daily expenses such as I outline in my blog post. Everything else goes into the I have some type of immediate or emergent need and the apartment fund which doesn’t get touched for any circumstance. So I had time and I decided with as cold as it was that if I went and panhandled for a couple hours moving around would even keep me warmer. Well I wasn’t long into it. Somewhere where other panhandlers are ALL DAY long and aren’t harassed. Now some of these other panhandlers are overtly aggressive. Walking up to cars, knocking on windows, going between lanes and even blocking traffic. I do not do this. I was approached by a police car that had three officers in it. One officer was the driver and didn’t say anything. One was the passenger and he was actually pretty nice, the third sitting in the back seat did most of the talking. For starters I could hardly hear him through the car. They asked for my identification. They were surprised to see that I possessed a valid drivers license. They asked what I was doing, I told them. The officer in the back kept telling me that I was lying, that I was scamming people. He kept asking me what drugs I do. I told him I don’t know how many times that I don’t do drugs. I told him if he didn’t believe me he could read this blog! So nice cop gets out of the car and asks me if I had anything on my I shouldn’t. I said no and proceeded to tell him what I had in my various pockets. The officer in the back comes out and pulls out my wallet. When he saw the little bit of money that was there that was all he needed to convince himself that I was scamming people. That’s when he said lets cuff him, we’re taking him in. When we got to the station the one that decided I was a menace to society I’m guessing went to do the report. The nice officer was the one that booked me in. He asked a couple of questions that I answered. When he found out I was a veteran he said you should’ve said something sooner. Well I didn’t think that had any bearing on the situation. I told him about this blog and even pulled it up on my phone for him so he could see I was being honest. Then he said if you have anything on you that you shouldn’t I’m going to let you go to the bathroom and shut the door. He asked this multiple times as well. I had to tell him multiple times again that I don’t do drugs. God forbid that someone who is homeless and panhandling isn’t on drugs. He searches me and finds nothing. Then his partner shows back up and says I want to take him to county for lying to us. Well I’m thankful that the nice one was there because he stopped that. Then I got to go through the booking procedure before being released. Now through the whole discussion the nice officer told me where I should go to panhandle. I was in District 1, he said to go across the bridge in the same area it was a different district and they won’t do anything. Tell me how that makes sense? Also I was told that I was lying multiple times. I offered ways to verify that I wasn’t. That wasn’t good enough for the one officer, what he chose to hear was enough. So I think in my mind that someone in a more powerful position is telling them to do something in a certain area and not others. 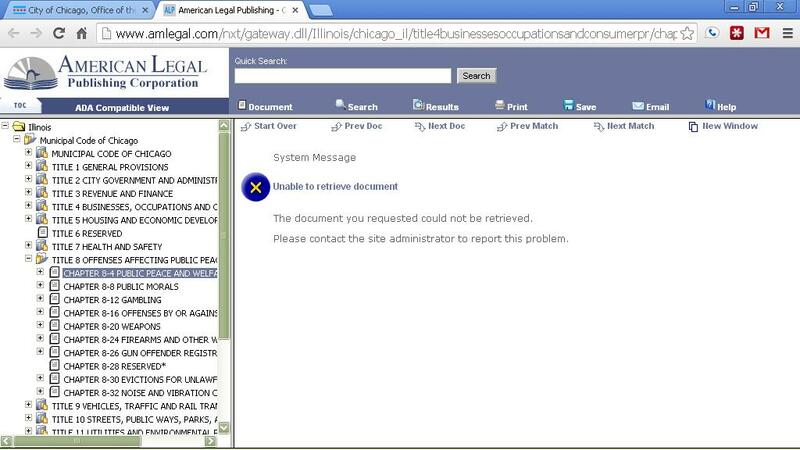 I’ve since tried to look up the actual panhandling ordinance in Chicago and a screen shot from the link posted on the website for the city comes up below. You can’t view it! So I managed to find it elsewhere and to say it is contradictory is an understatement. It also states what the definitions of aggressive panhandling is. The city has been sued multiple times and panhandling has been deemed to be a right protected under the first amendment on the constitution. The city even settled a class action lawsuit that paid panhandlers $400 each a few years back! Now if you read what I have since found I was in an area that could be deemed a gray one by the ordinance. However there is also another ordinance that states that charitable organizations can do everything that individuals can not! They can walk in between traffic and aggressively solicit. I’m a big supporter of charities being able to solicit funds, but isn’t that a little discriminatory against the individual? I do plan on going to court for the violation. They could have just as easily have said leave and I would have. For those interested the officer that was not very understanding was Police Officer D. Walker, badge #17817, Chicago Police Department District 1. 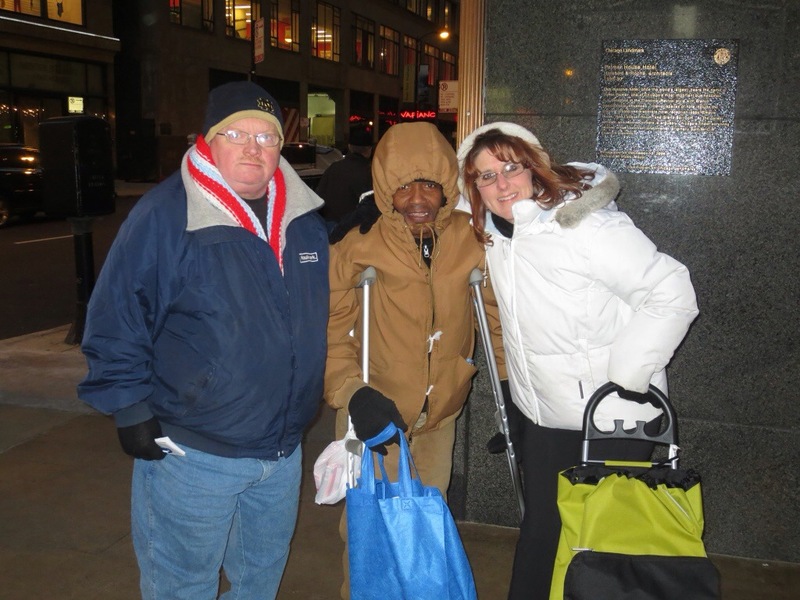 On December 21 my favorites Chicago and Michiana 5 for the Homeless will once again be in downtown Chicago distributing care packages, winter clothing and whatever else John may be able to come up with to make this cold a little bit easier. On December 22 Kristy Williamson is organizing a similar event. If anyone would like to help or donate any items to be distributed feel free to click on the links or contact me to make arrangements. The last trip was an eye opener for me so come on Chicagoland let’s help these people make a difference. My afternoon started yesterday around 3:30 meeting John Shafer and the other volunteers from Chicago and Michiana 5 for the Homeless. 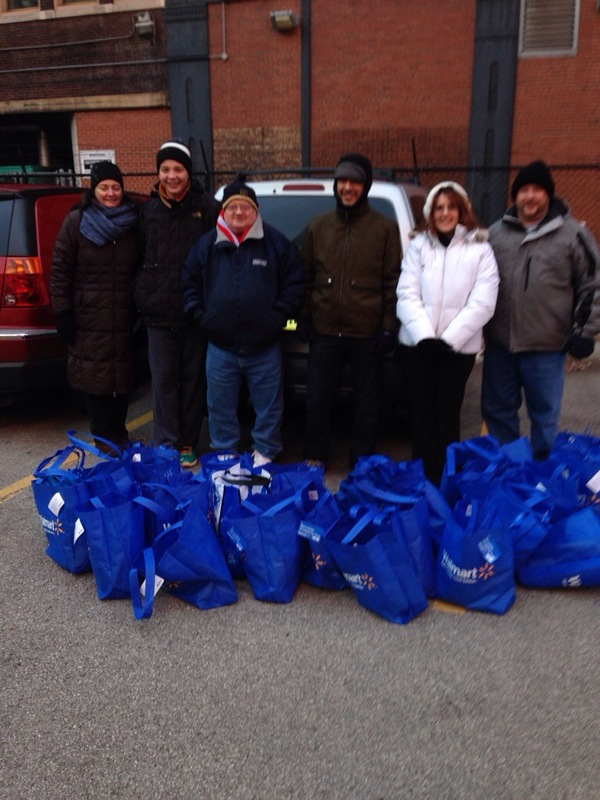 We gathered and picked up quite a few bags they had prepared with some essential items and hit the streets. We stopped everywhere that we saw a person on the corner, sitting in a cubby hole and let them know that here’s a little bit of help. Also that we would be setting up a little later if they needed some winter clothing. Towards the end of our walking around the theme of the day started. This goes to show how little I actually know but the start of so you have any socks began. As 5 o’clock approached we headed back to the park on State and Van Buren next to the Harold Washington Library. We met up with Raymond Lopez, the Democratic Committeeman from the 15th ward in Chicago. More on Ray later, but in addition to everything the Chicago and Michiana crew brought with them Ray also had a truckload of winter coats donated by people from his day job with Southwest Airlines. 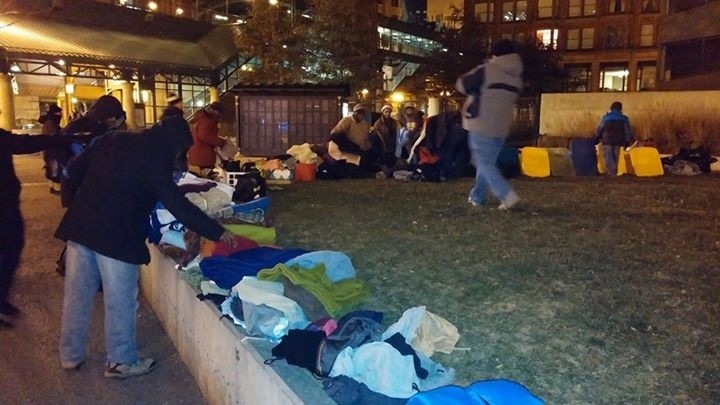 After setting up three truckloads of clothing it didn’t take long for the people who needed it to start coming up. This was about the time that Ray said to a couple of us let’s go drive around for a few minutes looking for more people. At this point he has no clue who I am, thinking I’m just another volunteer. This is where the experience really started as we entered Lower Wacker Drive. While I’ve driven through there before I never really noticed the people living there. We pulled over and talked to everyone we came in contact with. I was astonished to see the people with all of their meager belongings who called it home. The biggest surprise came when Ray asked, “Where did everybody go?” Apparently the city has begun rounding people up and kicking them out or arresting them. The look of disgust that I saw on Ray’s face told me he isn’t your typical politician. We weren’t gone that long, but when we returned to the park I was amazed to see there already wasn’t much left. By far the most often asked for item was socks followed by thermal underwear. Then the time came that I had a moment to talk to Ray and some of the people still coming up for the items that were still left. Apparently there has been a huge crackdown on the homeless getting harassed and arrested by the city. I guess with the holidays among is if they get swept up and put in jail that no one will realize that the problem is still there. That and how bad the social services that so many tax dollars get spent on how ineffective they really are. After we cleaned up I was invited to go eat with the other volunteers. It was definitely nice to get to be normal for a meal. Something I haven’t been able to experience for awhile. Also thanks to Ray for picking up the tab! After dinner I was getting ready to walk back to the truck when Ray said I have to go that way anyway I’ll give you a ride. That turned in to sitting at Dunkin Donuts for a coffee and really talking about how I ended up in this situation and what I’m doing about it. I also brought up after seeing everything earlier how fortunate I am compared to some of the people we saw earlier. 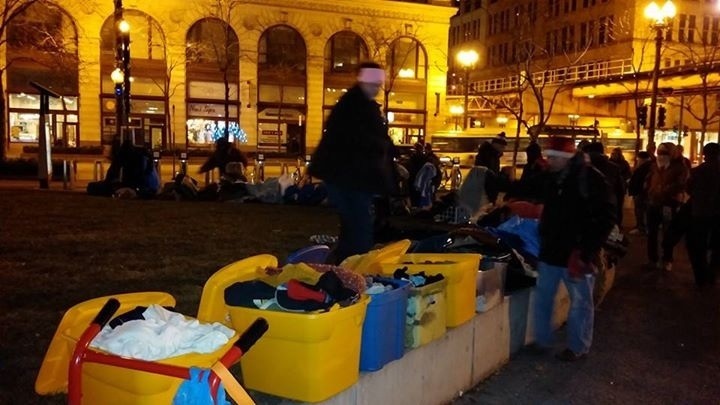 We will be doing this again on December 21, if anyone would like to donate any items for distribution, make a monetary donation to Chicago and Michiana 5 for the homeless or just want to come help feel free to contact me through one of the various methods I post here and will get you in touch with the appropriate people.